Reignfire debuts as Cable deals with the changes in X-Force since he left. X-Force holds vigil as Cable fights for his life in the wake of his fight with Magneto. 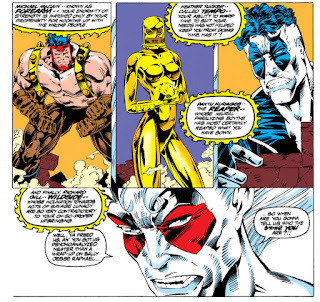 Three days after he regain consciousness, Cannonball & Sunspot leave for Madripoor, much to Boomer's dismay. 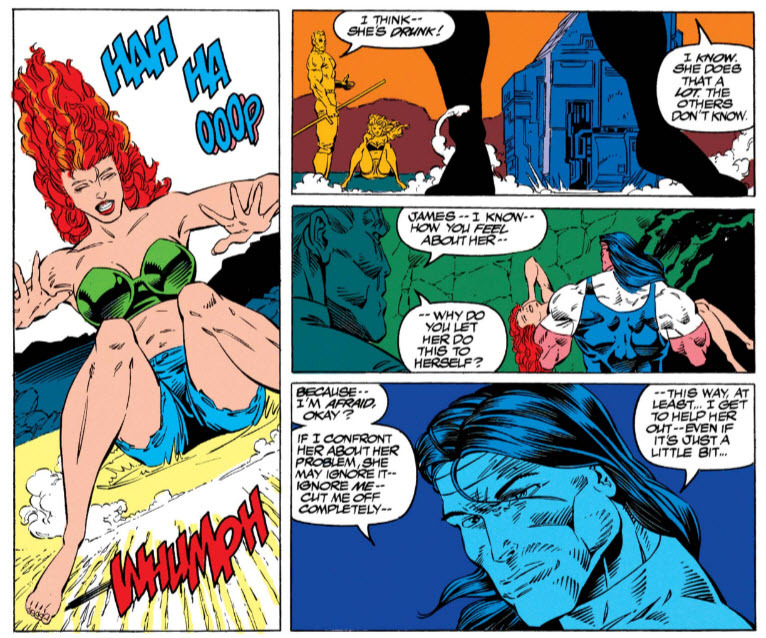 Later, a drunk Siryn hits on Shatterstar and Cable before passing out and being put to bed by Warpath. 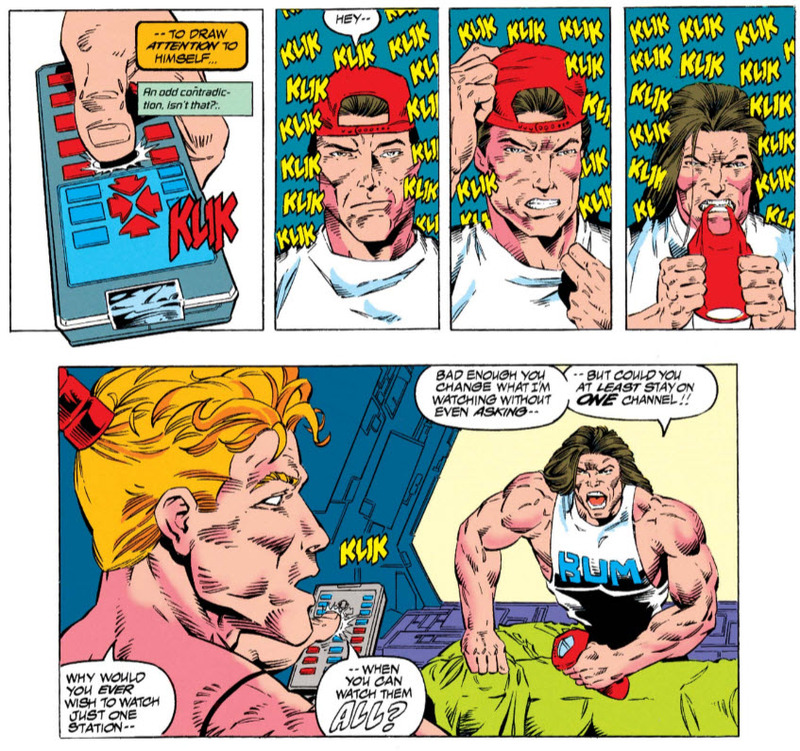 Later still, Shatterstar's TV watching habits irritate Rictor, who still doesn't like Cable. 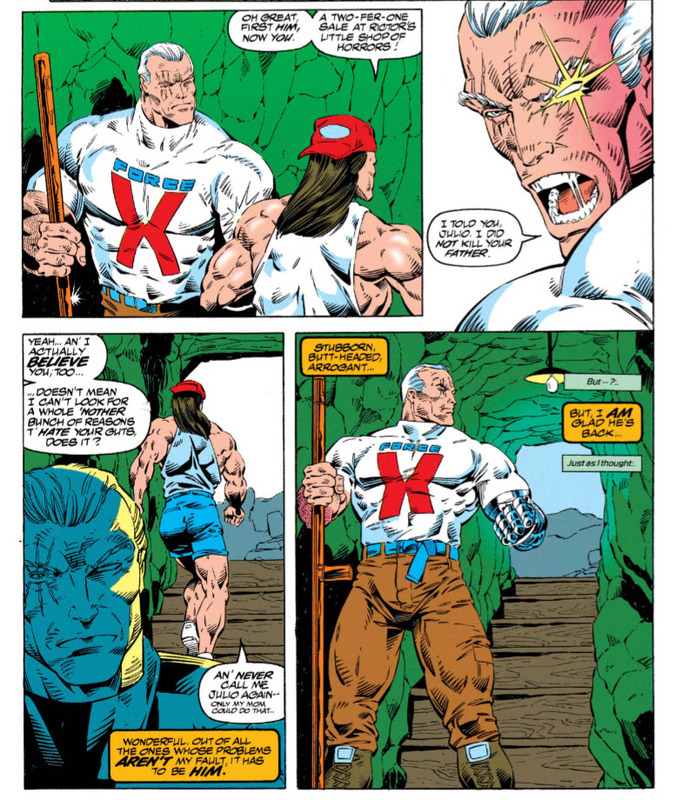 In the wake of his various observations of the team, Cable wonders if he can be a soldier, teacher, father and friend to the team, though he's decides to at least try. 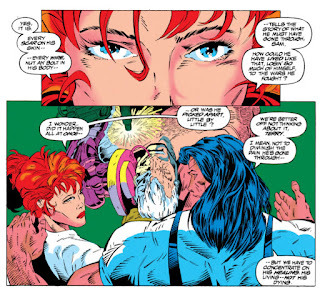 Meanwhile, Reignfire breaks former Mutant Liberation Front members Wildside, Forearm, Reaper and Tempo out of a Federal prison, and asks them to join a new iteration of the team, led by him. Their first mission: to capture and kill the head of Project: Wideawake, Henry Peter Gyrich. 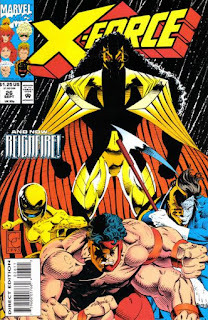 Reignfire makes his first appearance in this issue, essentially reforming the Mutant Liberation Front (as its leader) by breaking Wildside, Reaper, Forearm and Tempo out of prison. He represents X-Force's new mystery du jour, and will remain so right up until "Age of Apocalypse", when he'll be revealed to be a time-tossed Sunspot just before that storyline begins, only to be quickly hand-waved away after (and then, much later, he'll be retconned into not being Sunspot after all, sort of). In recruiting four of Stryfe's former MLF members to his new incarnation, Reignfire does that thing that is so in vogue at this time of stating each character's codename and real name, followed by a brief description of their powers and/or personality. As a result, we learn the real names of Wildside, Reaper, Forearm and Tempo this issue, and they get arguably more characterization, however expositorily, in four panels than in all their previous appearances combined (save for perhaps Tempo, who was at least shown to be somewhat conflicted about the MLF's actions against her father in X-Factor #78). Something I failed to mention with everything else going on in issue #25 is that it was Greg Capullo's last issue as regular penciler, ending a short but influential eleven issue run on the series. Matt Broome, an artist I know mostly as "that guy who drew a couple of issues of X-Force after Capullo left", draws this issue and the next, before new regular artist Antonio/Tony Daniel comes aboard (Capullo does draw the covers to this issue and the next, for what that's worth). 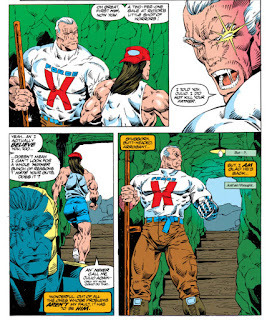 Cable's sentient computer program and the remnants of X-Factor's Ship, Professor, is now integrated with Cable's bionics as of this issue, in the wake of Cable rescuing him from Avalon in the previous issue, which basically just means Cable is now capable of having a discussion via internal monologue. Cannonball & Sunspot leave this issue to tell Karma, who is in Madripoor (which is where we last saw her, cutting ties with her criminal uncle, in Wolverine #30), about Illyana's death. We won't actually see her, but she will show up for the upcoming "Child's Play" crossover with New Warriors that wraps up the Upstarts plotline, and having her existence and history with the characters acknowledged is still appreciated. 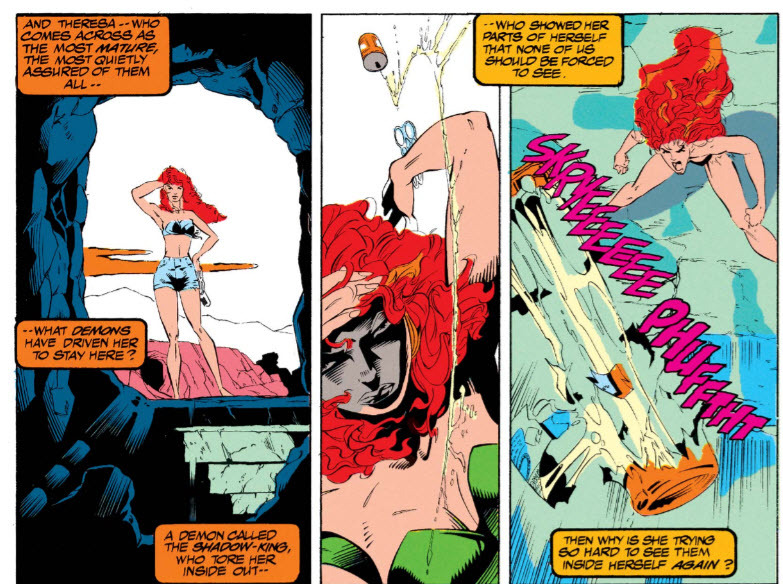 Siryn gets drunk in this issue, and it's revealed that this is something of a regular occurrence, to the point where Warpath has taken it upon himself to watch after her and keep her safe as she drinks; this marks the beginning of the "Siryn is an alcoholic" subplot and an intensifying of their romantic pairing, hinted at a bit in the past, as Warpath admits that he doesn't try to stop Siryn more aggressively because he's afraid if he does, she'll push him away. The opening pages of this issue feature Cable struggling to survive Magneto's attack on him from the previous issue; it then jumps ahead to where the character is back up walking around, but still healing. 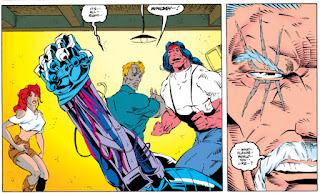 There's a lot of talk about how much of a machine Cable is, "nuts & bolts" cracks, things like that, which are somewhat at odds with the later revelation that most of Cable's metal parts are the result of the techno-organic virus he was infected with as a child. 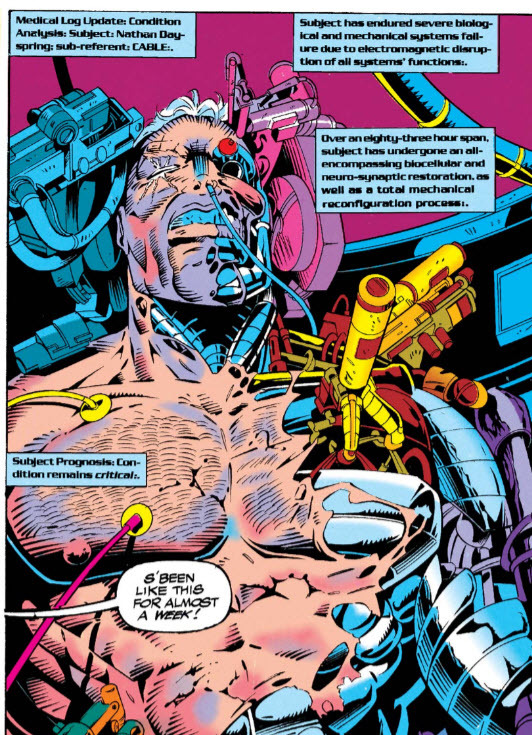 Of course, even if Nicieza had that in mind already, X-Force wouldn't know it at this point, but even the art is still depicting Cable's metal parts as much more analog/traditionally-cyborg. As Sam leaves for Madripoor, Boomer grumbles and mentions not knowing the place, despite the fact that she fought Stryfe and the MLF there alongside Wolverine in New Mutants #93-94. Cable notes that Siryn was left messed up by her possession by the Shadow King circa the "Muir Island Saga", something that's never really been presented in the text before (she just sort of showed up in issue #3 and has been a part of the team ever since, without issue), but still makes sense and adds some dimension to her character, albeit, once again, fairly expositorily. In a more subtle bit of characterization, Shatterstar, born and raised on the media-obssessed Mojoworld, is shown to be a channel surfer, in that he only ever surfs so as to watch as much TV as possible. 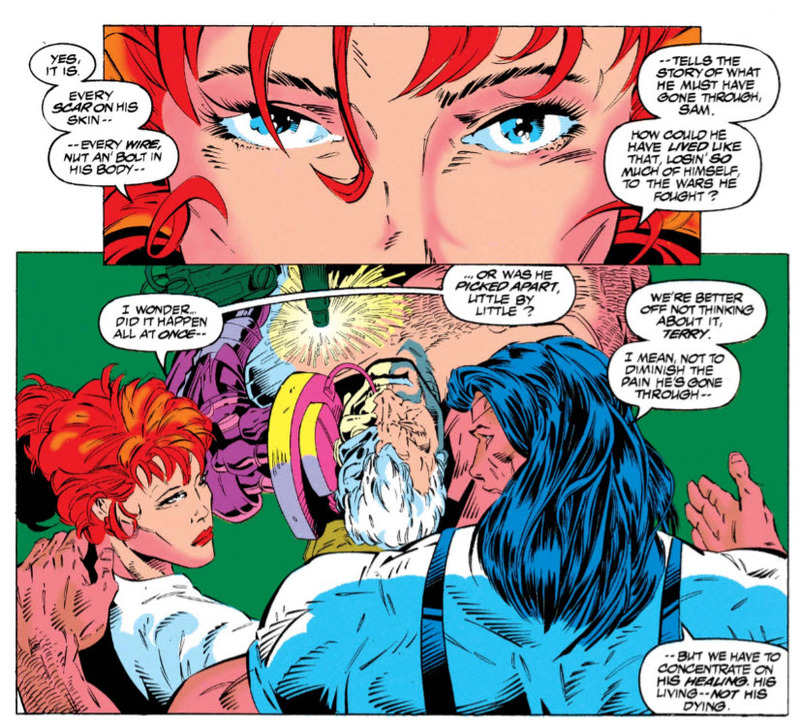 Despite acknowledging that Cable did not, in fact, kill his dad, Rictor still doesn't like Cable very much, though Cable is glad both he and Sunspot are back with the group. At one point, Rictor can be seen watching Batman: The Animated Series. There's a weird one panel shot as Cable wakes up that makes it look like he has his goatee from contemporaneous issues of Cable, but it doesn't appear before or after that one closeup panel. Presumably in an effort to bump up the soap opera elements of the book, Rictor makes a move on Boomer as soon as Sam leaves, though she immediately rebuffs him, and I don't think this leads to any ongoing love triangle for the three. 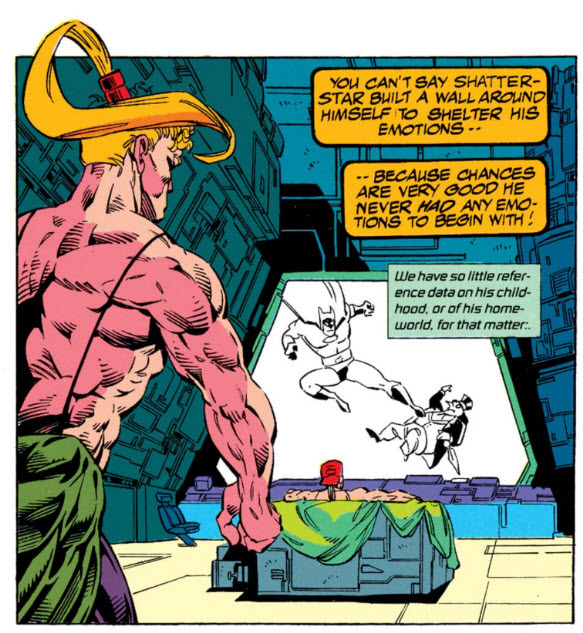 Meanwhile, Feral's attraction to Shatterstar is becoming more obvious. A letter in this issue conveniently asks when Dani Moonstar is going to be seen again. Hot on the heels of X-Men #24, this is another Nicieza Quiet Issue (though it's final pages setup the next story by introducing Reignfire and the new MLF). It's wisely built around Cable, and Nicieza uses this as an opportunity to essentially reintroduce the character after his prolonged absence, and integrate him into Nicieza's post-Liefeld take on the series. It's effectively a more dedicated version of similar efforts sprinkled throughout the previous issue, and while the end result is by no means as compelling as similar "Quiet Issue" efforts from Lobdell nor as effective at establishing a specific overriding tone as X-Men #24 (it's mostly a lot of Cable thinking how much various X-Forcers are or are not like he was at a similar age, and how he needs to take a different approach with them than he did in the past), it's an appreciated and necessary reflection for the character. In the wake of all the changes the series and characters have gone through, the only way Cable could be credibly reintegrated into the book is to have him reflect on those changes, and this issue gets that done. Tomorrow, Excalibur #69. Next week, Uncanny X-Men #305 and X-Factor #95. Looks like Broome sure loves suspenders and rectangular faces, Sam's in the panel you posted being the worst. 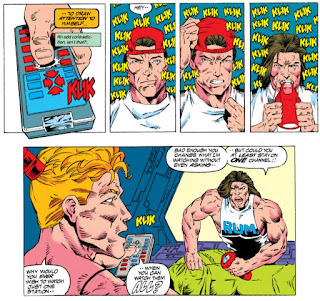 And the idea that Cable has designed and printed xforce tshirts for his off days is hilarious. Awful art aside, has anyone ever explained why Wildside and Reaper are both white skinned and have colored squares in their face? Wow, I didn't realize Greg Capullo only did eleven issues of X-FORCE. Having never read the series but seen it from afar, I always thought he had a run of a couple years! I recall everyone at the time basically knowing Reignfire was Sunspot. I know it was presented as a mystery, but my recollection is that no one I knew, at least, had any doubt of who he was supposed to be, and I was under the impression (again, as an outsider looking in) that Nicieza wasn't really trying all that hard to make him appear to be anyone else. Kudos, I guess, for not changing things up after too many people figured it out. That's how we wound up with a Sabretooth who wasn't Wolverine's dad after all. Has it ever been explained how Reignfire can fly? Lastly, I'm about to show how culturally ignorant I am, but does anyone know what ethnicity the name Pantu Hurageb is? I don't think I've ever seen one like it. I didn’t realize I’d read a whole eleven issues of X-Force drawn by Greg Capullo already. This is around the time my Buying All The Comics habit began to lead to burn out (and bear in mind, I had been doing it since 1976, so that took a long time) and for some reason, this particular issue of X-Force was the one that made me say "what am I doing?" 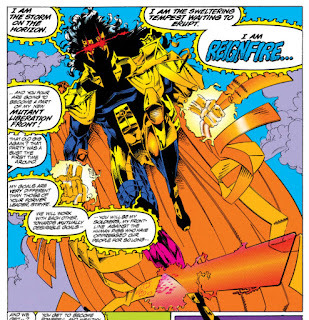 I've never been sure why: this is a perfectly serviceable set up issue, Reignfire is no more or less silly than any other 1993 villain (and hey, his name could've been spelled Reynfyre!) but this is the comic that made me realize I was reading entirely too many comics. I kept going on X-Force for a few more issues, but this was the time frame where I dumped X-Factor, just about all of the DC I had been reading, and scaled my Image purchases back to a handful. And yet I still don't know why it was this one. Something had to be the straw that broke the camel's back, I guess. The poignancy of that panel on Pg. 4 in which Cable raises his arm — just before his sudden mustache — is rather marred by the fact that the wrong arm is shown being raised. Yeah, I know... ’90s comics; subset: Marvel; subset: X-Force. And the gist of it still gets across. And I’m sure it didn’t bug everybody. And the generally terrible nature of the artwork is more offensive. Sally Jessy Raphael gets name-checked yet again, and yet again the Jessy is spelled Jesse (about which I could not care less but for general principle). Boomer kicks up a curious amount of cave dust just standing around on Pg. 8, especially since the art has at least as many feet in it as it does instances of suspicious avoidance of feet. I was hoping the post and comments here would address Boomer’s reference to Cannonball as “Sam Guthrie, boy External mutant immortal” — which apart from being a mouthful is a plot point I’d thought from previous discussion got dropped in short order (or shorter order, I guess, even if this is the last it’s referenced). And speaking of mouthfuls, Ric plants a smooch on Boomer amidst casting doubt on Sam’s feelings toward her when she expresses concern over how he'll outlive everyone. His Sudden Mustache is my new band name.